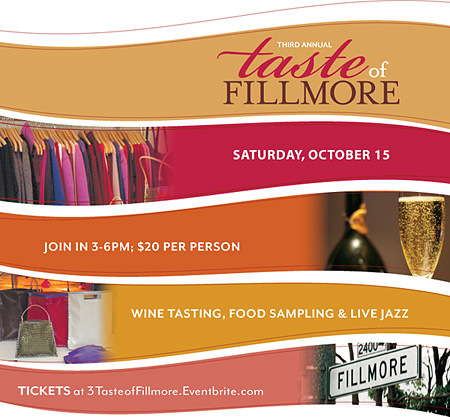 Fillmore Street will be showing itself off again on October 15th, with the 3rd annual Taste of Fillmore event. Guests will cruise down Fillmore between Jackson and Post from 3 to 6 PM, tasting the delicious bites, drinks, and sites (tasting with your eyes, of course) that Fillmore shopping has to offer. Shop owners will be opening their doors and offering goodies like wine tastings, skin consultations, raffle prizes, discounts, and sidewalk fashion shows. There will be live jazz music to add to the festivities. As if that wasn’t sweet enough already, Taste just so happens to fall on my birthday. Come out to help a party girl celebrate in true San Francisco fashion. · Toujours: serving refreshments, raffling a $75 gift certificate, and putting on a fashion show celebrating 25 years! As if that wasn’t freakin, spankin awesome enough, wineries will be pouring at the different shops as well. VERGE Winery will be serving Syrah from a similar vein of vineyard, one which is organic and bio-dynamic. Keeping it local, Gloria Ferrer will be pouring champagne made just 40 miles north of our own fabulous city.